After being closed to the public for three years, the beloved Canadian Science and Technology Museum in Ottawa, Ontario has re-opened their doors to present a reimagined museum with an interactive and relatable learning experience. While walking through the newly organized space, three months ago, I noticed that there is a balanced blend of the past and present, keeping certain museum classics like the gorgeous steam trains in Steam – A World in Motion, while offering new exhibits such as Sound by Design and Wearable Tech. An exhibit that I particularly enjoyed is Technology in Our Lives, which outlines the impact of technology on household items and the evolution of environmental knowledge. While going through this well-compiled exhibit I thought about how each item is moving towards contributing to the Internet Of Things, which “describes the extension of the internet to the physical world through rooted embedded technology”(Outlook 2021) and the ways in which the different technologies that we use every day will be affected. It will be interesting to observe changes as we make continuous progress in the development of ICT. With this development in the ICT sector, we also see around 216,000 digital professionals will be needed by 2021. Getting people educated about ICT and other STEM topics at a young age will assist in bridging this gap and will complement the learning happening at the museum. 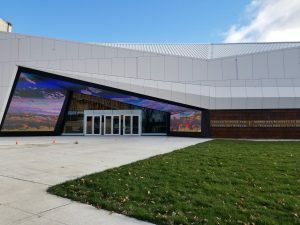 ICTC understands that providing programming and training for youth in and outside of the classroom will assist us in seeing places like the Canadian Science and Technology Museum grow and continue to be a place to admire where technology started and help propel our innovations into the future. Visit ict4all.ictc-ctic.ca for tools and resources for all ages that you can use as a parent and an educator. The Student Work-Integrated Learning (WIL) Program supports partnerships between employers and post-secondary education (PSE) institutions to create more work-integrated learning placements for students enrolled in post-secondary studies across Canada. The program focuses on occupations in STEM and business. ICTC is one of the partners to deliver the program, working with employers and PSE institutions in the information and communications technology (ICT) sector. Under WIL Digital Program, employers offering quality work-integrated learning placements to PSE students are eligible to receive wage subsidies through ICTC. WIL DIGITAL is another incredible opportunity to shape Canada’s future workforce. Learn more about ICTC and the research and work we are doing to assist in the growth and innovation of the digital economy at ictc-ctic.ca or visit etalentcanada.ca.